Thanks to a savvy performance/trading coach for forwarding an excellent NY Times article on "Talking About Failure". Talk about our failures? For most of us, that's the *last* thing we feel like doing! The idea makes sense, however. Not only does talking about our failed ideas and failed trades help us put them in perspective; it also enables us to accept them, learn from them, and put them into perspective. On your flat or down days/weeks, reach out to other, similar traders who made money on the day/week and learn what they did and how they did it. Let them talk about their success and see what you can take away as ideas, learning lessons, and goals going forward. Having one or more trading "buddies" who can openly talk about mistakes and successes helps everyone cement what they did right and learn from what didn't go right. And if you have no trading buddies? It's worth reviewing your trading and looking for the plausible opportunities you may have missed. In other words, if you had been trading your way, at your best, what might you have done differently? In that situation, you are looking to the ideal trader within you to act as your "trading buddy". 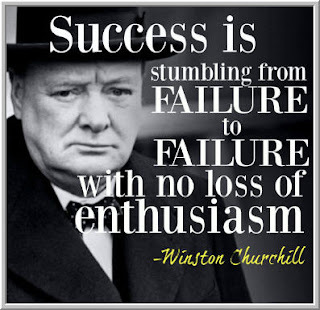 By openly facing your "failure" and using it to prod your ideal trader, you turn setback into learning and opportunity. The psychology of having flat or down periods is determined by whether you view them as setbacks and defeats versus inspirations, prods, and opportunities for growth. Churchill had it right: it's all about failing enthusiastically.